Who makes the cut for the best possible 25-man roster for the National League? Jay Jaffe gives his choices for the starting lineup, reserves, pitching staff and bullpen. From 1933, the year of the first major league All-Star Game, through 1997, the roster sizes for each side in the Midsummer Classic never topped 28 men. Starting in '98, when MLB’s latest round of expansion increased the number of teams to 30, the size of the All-Star squad began to balloon: To 30 that year, 32 in 2003, 33 in '09 and 34 in '10. The result has been a game filled with more and more players who don’t deserve to be called All-Stars. Starters for this year’s game, which will be held at Great American Ball Park in Cincinnati, were announced Sunday, with the reserves revealed on Monday. (The Final Vote results will be revealed in a few days). We already know some players—like the injured Miguel Cabrera and Giancarlo Stanton—will need to be replaced, so by the time of the game on July 15, there will be at least 70 men who are officially designated All-Stars this season, or nearly 10% of all players in the majors. With that in mind, SI.com baseball writers Cliff Corcoran and Jay Jaffe have decided to slim down the All-Star Game by constructing 25-man rosters for each league with the following setup: Eight starting position players, one designated hitter, one backup catcher, two backup infielders, two backup outfielders, six starting pitchers and five relievers. Both Corcoran and Jaffe focused on fielding the best possible team right now, though there are cases where a player's established levels beyond the past half-season were used to make tough choices. Here are the players Jaffe chose to comprise the National League's squad. You can find Corcoran's AL picks here. The fans got this one right, electing the Arizona slugger to the starting lineup for the second straight season. If not for Bryce Harper, Goldschmidt would be the favorite for NL MVP, as he's in the midst of his best year and, with a bit more thunder, has a shot at the Triple Crown. He leads the NL in batting average and RBIs and is fifth in home runs, while also ranking second only to Harper in, on-base percentage, slugging percentage and WAR (5.8 to 6.1). The 24-year-old Panik has just 154 major league games under his belt, but he played a significant role on a World Series winner last year and this year he has helped keep his team afloat despite injuries and roster turnover. His OPS+ is tops among NL second-sackers, and his 2.8 WAR is tied with the flashier Dee Gordon for No. 1 in that category as well, but Panik gets the nod here on the basis of Gordon's disappearing act in the second half of last season. Like Panik, the 28-year-old Crawford is a deserving first-time All-Star and a key reason that the Giants have stayed in contention, thanks not only to his exceptional defense (+12 DRS) but also a breakout with the bat. His OPS+ is a career high, well ahead of last year's previous-best 106 and miles above the 86 across his first three big-league seasons. Meanwhile, Crawford's 4.1 WAR is far enough ahead of the second-ranked NL shortstop, elected starter Jhonny Peralta (2.5 WAR), to overlook the latter's 2014 advantage (5.7 to 3.3), as Peralta was boosted that year by an out-of-character +17 DRS; he's at -18 for the remainder of his career. Already a two-time Gold Glove winner for his off-the-charts defense (+61 runs in 321 career games, or two seasons' worth), Arenado has continued to improve at the plate, making him a worthy first-time All-Star. His slugging percentage ranks fourth in baseball, and it's not just a function of Coors Field, as 15 of his 24 homers have come on the road. His 3.6 WAR ranks eighth in the league, one-tenth of a run behind elected starter Todd Frazier; it's the outstanding glovework (+15 DRS, +8 UZR) that gives Arenado the nod here. Posey's OPS+ trails the 154 of Los Angeles' Yasmani Grandal, but his 33% advantage in playing time and his superior defense give him more than double his NL West rival's WAR, 4.0 to 1.5, and that's before getting into their longer track records. With Yadier Molina limping along offensively after last year's injury-shortened season, there's no doubt who the NL's top catcher is. At first glance, it's tempting to say that one of the few things that has gone right for the new-look Padres is the play of the junior Upton (as opposed to Upton, Jr.). His 3.2 WAR already matches the total he put up for the Braves last year and is nearly a full win ahead of the second-ranked NL leftfielder in that category, Pittsburgh's Starling Marte. Nevertheless, the 27-year-old Upton has been mired in a prolonged slump, batting .183/.293/.258 with two homers in 140 PA since the start of June. Overall, he's hitting well enough to get the nod here, but let's hold off on the parade. Thanks to a .194/.302/.333 line in April, McCutchen trails the Diamondbacks' A.J. Pollock in WAR (3.7 to 3.0), but he's hit a sizzling .336/.427/.555 since the start of May to help the Pirates to the league's second-best record despite their own sluggish start. Cutch’s hot streak has pushed his OPS+ well ahead of Pollock (150 to 117), and his track record includes four previous All-Star berths plus an MVP award and two other top-three finishes in the voting. Watching Harper destroy both NL pitching and the "most overrated" narrative has been 2015's top pleasure, at least from this vantage. Finally back to something close to full health after last year's injury-plagued season, the 22-year-old slugger leads the majors in WAR (6.1), on-base percentage, slugging percentage and OPS+, and he's tied for second in the NL in homers. Insert mic drop here. Third in OBP and OPS+, sixth in SLG and tied for eighth in WAR (3.6), Rizzo would merit a starting spot if not for Goldschmidt. Thanks to Stanton's broken hamate bone, he ranks as the best hitter I'm otherwise unable to fit into the starting nine or justify in a bench role on the basis of defensive versatility. He's no longer flirting with a .400 batting average, but after a breakout 2014 in which he earned All-Star honors, he was elected by the fans this season. It's hard to fault them based upon his .335/.356/.413 (113 OPS+) line, which has him third in the league in batting average, though his 29 steals in 40 attempts have been essentially break-even. His big breakthrough has been on defense—one reason that the new Dodgers regime decided he was dispensable, leading to his off-season trade to Miami—where he's continued to improve, from -5 DRS and -3 UZR last year to +9 and +7, respectively. 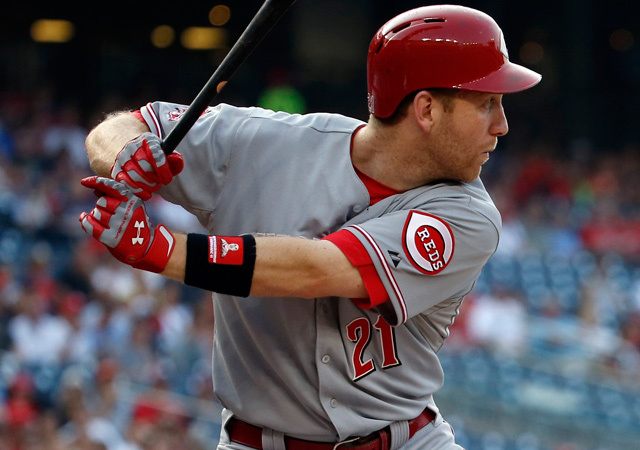 Elected to start by the fans, the 29-year-old Frazier is in the midst of a breakout season. He's tied with Harper for second in homers (25) while batting .281/.338/.590 with a 151 OPS+; the last two of those numbers rank fifth in the league. His 3.7 WAR is a click better than than Arenado's, and he's no slouch defensively—he's nine runs above average since the start of last year via both DRS and UZR. I made the tough call to put him on the bench here in part because of Arenado's flash, and in part because of Frazier's additional capability at first base and both outfield corners. At 32 years old and with over a year of his bat producing at roughly his 2008–10 level (including .289/.331/.368 for a 94 OPS+ this year) instead of his '11–13 peak, it seems apparent that Molina has entered his decline phase. Even so, he's still an outstanding defender, adept at framing (+7.4 runs, sixth in MLB) and stopping the running game (42% caught stealing). Even with Grandal's step forward on both the offensive and defensive sides (including an MLB-high 14.6 framing runs), the track record gives the St. Louis backstop the edge here. If health weren't an issue, Stanton would own one of the NL outfield slots at the very least, but his injury knocks him out of contention here. Pollock is third among NL outfielders in WAR at 3.7, hitting a solid .301/.344/.460 for a 117 OPS+ with 10 homers, 18 steals and 10 DRS. In fact, his 7.4 WAR over the past 1 1/2 seasons ranks fourth among NL outfielders behind Stanton, McCutchen and Jason Heyward despite Pollock playing only 157 games. Look past the .230 batting average and the 100 strikeouts, because the rest of the 23-year-old rookie's game has been everything the Dodgers could have hoped for: 20 homers, a .368 OBP, .496 SLG and highlight-caliber defense in centerfield. On a team that's been 44 runs below average at that position over the previous three seasons, Pederson's +2 DRS is heaven-sent, and his 2.8 WAR is sixth among NL outfielders. If the idea of choosing an All-Star team goes a millimeter beyond a pitcher's current season won-loss records—and it certainly should—then it's flat-out ridiculous that three-time Cy Young winner Kershaw has to go through the Final Vote instead of having a spot on the NL squad. He's striking out more batters than ever (an NL-high 11.6 per nine, with a 5.4 K/BB ratio), and while his ERA is a relatively gaudy 3.08, it's inflated by aberrations in BABIP (.304, 26 points above his career norm) and home-run-to-fly-ball rate (16.2% against a 7.1% career norm). His 2.54 FIP ranks second in the league, while his 2.12 xFIP is the majors' best, so whether he winds up in Cincinnati, Kershaw gets a spot here. 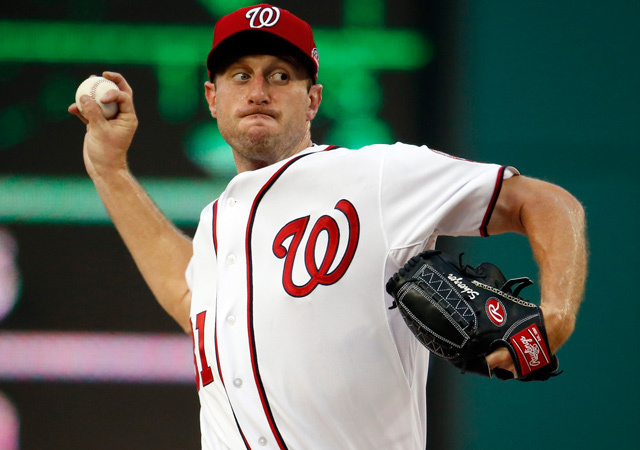 In a one-game contest, though, the starting nod on my roster would go to Scherzer, who's first in FIP (2.04), second in WAR (4.4) and strikeout rate (10.4 per nine) and fourth in ERA (2.12), with his recent flirtations with perfection providing some of the season’s most indelible highlights along the way. Kershaw's teammate, Greinke, leads in ERA (1.48) and WAR (4.8), so he gets a spot, too. After that, the choice boils down to maybe six or eight starters for three slots. Hamels is tied for fourth in WAR this year (3.5) and first in the league over the last 1 1/2 seasons (10.2), while Cueto is sixth and second by those measures (2.8 and 9.3, respectively), giving them stronger cases over one-season wonders A.J. Burnett (second in ERA at 1.99 and tied for third in FIP at 2.61) and Shelby Miller (third in WAR at 3.6 and in ERA at 2.07), strong as their 2015 showings might be. On the other hand, Gerrit Cole's breakout (tied for third in FIP at 2.61, fifth in ERA at 2.28) seems worth recognition, with his strong strikeout rate pushing him past Miller. And I haven't even mentioned the Mets' Jacob deGrom, who's built on his NL Rookie of the Year showing from 2014 and outpitched teammate Matt Harvey. Particularly given the small samples of a single season of closer work, it's worth looking at a bigger picture. Represented herein are four pitchers with ERAs below 2.00 over the last 1 1/2 seasons (all but Jansen, whose 1.76 FIP makes up for it) and three with strikeout rates over 37% (Chapman, Jansen and Kimbrel). That leaves out 2015 breakout Trevor Rosenthal, whose 69 saves for the Cardinals over that span pace the circuit, as well as setup man/Papelbon heir apparent Ken Giles, whose 1.81 FIP and 33.7% strikeout rate can hang with the rest. We can't take everyone and we can't split hairs all day, so apologies to those two as well as Pirates lefty Tony Watson, who'd make the squad if I could spare a spot for a specialist.